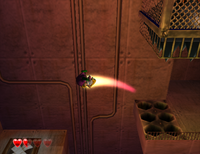 The Corkscrew Conk is a Special Move in the Nintendo GameCube game Wario World. If Wario begins a Dash Attack, but jumps right in the middle of the move, he will hurtle into the air, wildly spinning. This can work like Mario's Spin Jump, allowing him to breach large gaps but it also serves as a very powerful attack that can even smack powerful enemies into the air to damage other enemies, or to hit an out-of-the-way button. Wario won't be able to regain control until he lands. ↑ Wario World instruction booklet, page 8 (PAL) or page 10 (NTSC). This page was last edited on April 8, 2019, at 10:02.